Customers of Australian bank Westpac will soon be able to use an innovative replacement for the default keyboard found in social messaging apps such as Facebook Messenger and WhatsApp to make P2P money transfers to friends, family and businesses as well as send cardless cash codes to recipients for ATM withdrawals. Westpac employees are also trialling a device designed to add NFC payments to any wearable which will become available to customers later this year, the bank’s consumer banking CEO George Frazis has told the Australian Financial Review (AFR). 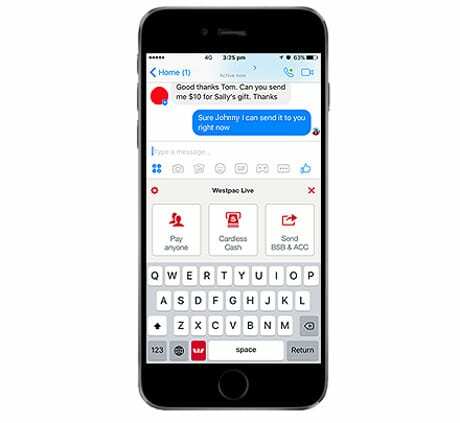 The Westpac Keyboard feature — built using technology supplied by Israeli startup PayKey — works through an integration with existing messaging apps to add banking options to the bottom of the screen of the chat app. It gives customers three options — Pay Anyone, which allows money transfers; Cardless Cash, which allows cardless cash codes to be sent to recipients for ATM withdrawals; and the option to share your BSB and account number with others. “The Westpac Keyboard is an extension of the Westpac Live iPhone and Mobile Banking app and is activated via iOS device settings,” the bank says. “It provides a tailored keyboard to enable some everyday transactions, which you can perform without leaving their message. You can enjoy the security of using your own bank account to pay friends directly within any of your favourite applications. “To install the Westpac Keyboard, open the Westpac Live Mobile Banking app and tap the menu button in the top left of the screen. Select ‘Westpac Keyboard’ and follow the prompts. You are not able to add a new Payee or make first time payments to new Payees using the Westpac Keyboard. You will need to sign in to Westpac Live Online Banking or the Mobile Banking app to add a new Payee. Westpac is one of four of the country’s biggest banks currently battling for access to the NFC technology within Apple’s iPhone handsets.